Blackberry phone might be overshadowed by the success of iPhone and Android, but still they offer a powerful combination of hardware and software. There is a huge community including especially the business persons who loves to use Blackberry phones because of the enterprise solutions company provides to them. But, Blackberry has changed over the past few years and they have now plenty to offer for every group to enjoy their phones. One of the biggest change in the Blackberry : ease of communicating with your friends and family. You can chat with your family anytime, upload your favorite photos to various social networking sites like Facebook, Flickr, stay connected with your Linkedin account and much more. Whether you love to chat with friends or stay connected through social networking sites, there are handful of apps available out there that are free to download and use. These apps helps you to stay in touch with everyone you want from anywhere in the planet. But, finding appropriate apps is sometime a time-taking job, so I am doing it for you. In this article, I am listing best free communication apps for Blackberry that will help you to stay connected 24×7. So, have a look on SaveDelete’s compilation of 13 best free communications apps for your blackberry to stay connected anywhere. 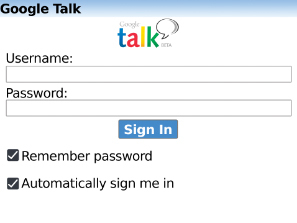 1) Google Talk : Google Talk™ for BlackBerry® smartphones delivers a fast and reliable messaging experience while you’re on the go.1 From your BlackBerry smartphone, you can chat with friends about plans for the weekend, instantly share photos from tonight’s party, and always be part of the conversation. 2) Yahoo ! Messenger : Leaving the house doesn’t mean leaving your friends and the conversation behind. 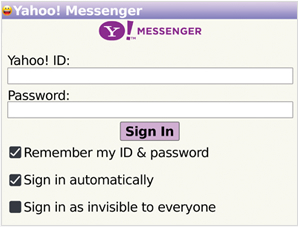 Yahoo!® Messenger for BlackBerry® smartphones lets you chat in real-time, send and receive pictures, and much more – from almost anywhere with your BlackBerry smartphone. 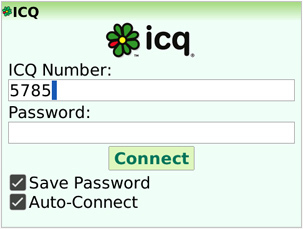 3) ICQ Messenger : Enjoy all of the features you love about ICQ® Messenger on your BlackBerry® smartphone. Chat with real-time conversations, send and receive pictures and always know who’s online and chatting while you’re on the go. 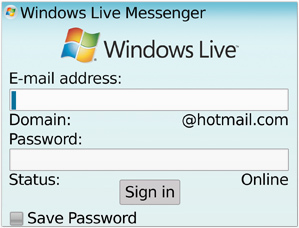 4) Windows Live Messenger : Stay in the conversation, even as you’re heading out the door. 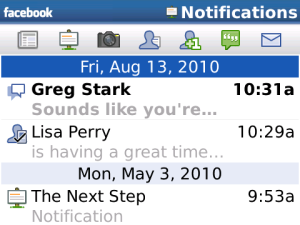 Windows Live™ Messenger for BlackBerry® smartphones places the desktop IM experience – from sending text messages to sharing photos – onto your BlackBerry smartphone. 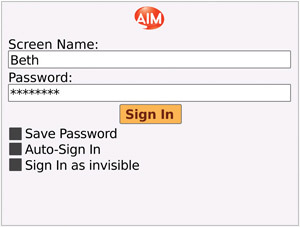 5) AOL Instant Messenger : Take all of the great features of AOL Instant Messenger™ (AIM) chats with you on your BlackBerry® smartphone. AIM on your BlackBerry® smartphone lets you connect to all your friends while you’re on the go. 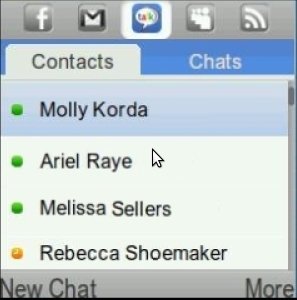 6) Meebo Blackberry : Finally, a multi-chat client, if you don’t want to login into several apps at the same time. 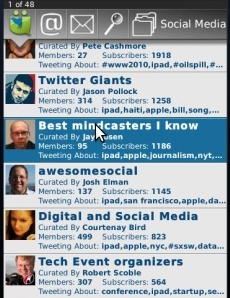 A Meebo app designed especially for BlackBerry. It’s fast, it’s free, and it’s just plain nice to look at. Available now for touch-screen and trackball models. 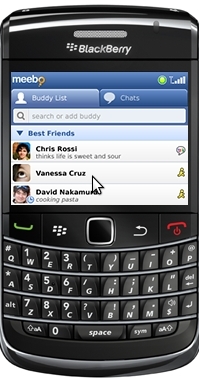 7) Facebook : Stay on top of your social life with Facebook® for BlackBerry® smartphones. This free application makes Facebook services – like sending messages, poking friends, writing wall posts, inviting friends to join and uploading photos – available on the go! Take Facebook wherever life takes you and don’t miss a beat! 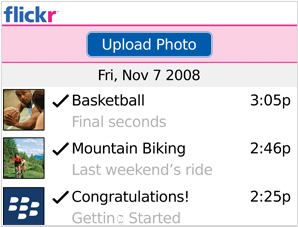 8 ) Flickr : Download the Flickr® Uploader for BlackBerry® smartphones to snap and share your photos.1,2,3 Delivering the same uploading and geotagging4 features as the desktop version, Flickr Uploader for BlackBerry smartphones is your instant, portable photo album. 9) UberTwitter : UberTwitter is a full featured location aware Twitter client which supports all of the features of Twitter as well as advanced capabilities such as: photo integration, embeded videos in tweets, tweet shrinking, URL shortening, twitter lists, changing your twitter avatar, saved searches, conversation threads, twitter profile editing, view who is retweeeting you, and a plethora of other features. 10) MySpace : MySpace meets your BlackBerry smartphone. Do more of the things you love on MySpace® from just about anywhere. Upload photos, view your friends’ updates and post comments and bulletins. 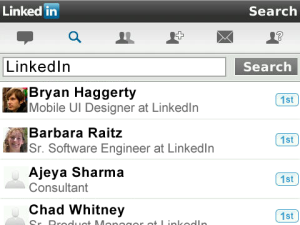 11) Linkedin : LinkedIn for BlackBerry puts your professional network just a touch away. Walk into any interview or client meeting with the ability to look up the details and connect with over 70 million professionals worldwide. Get the latest updates and messages from your network and keep them up-to-date with your status in real-time. 12) iSkoot for Skype (Blackberry) : With iSkoot for Skype, you can make & receive Skype calls, chat, and use SkypeOut to call regular numbers anywhere in the world. 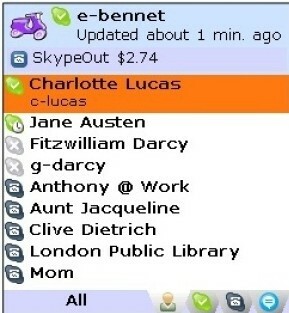 And with our newly enhanced feature set, now you can easily place SkypeOut calls to anyone in your general address book, and enjoy cool new Skype chat features like emoticons and multi-party chat. What’s really great about iSkoot: unlike other mobile Skype apps, iSkoot is a thin client – so it won’t take up loads of memory or eat up your battery power. 13) SocialBeat : Stay connected to Facebook, MySpace, Twitter, Google Talk and over 50 news, sports & entertainment feeds. Social Beat is a free application for your BlackBerry® with an all-in-one connection to your favorite web services. You ll see the latest tweets, posts, updates, photos and IMs. Respond on the fly with comments, status updates, retweets, @replies and more. And you can subscribe to your choice of live news feeds from top sites like The New York Times, CNN, ESPN, TMZ, The Onion, MTV News and Huffington Post.